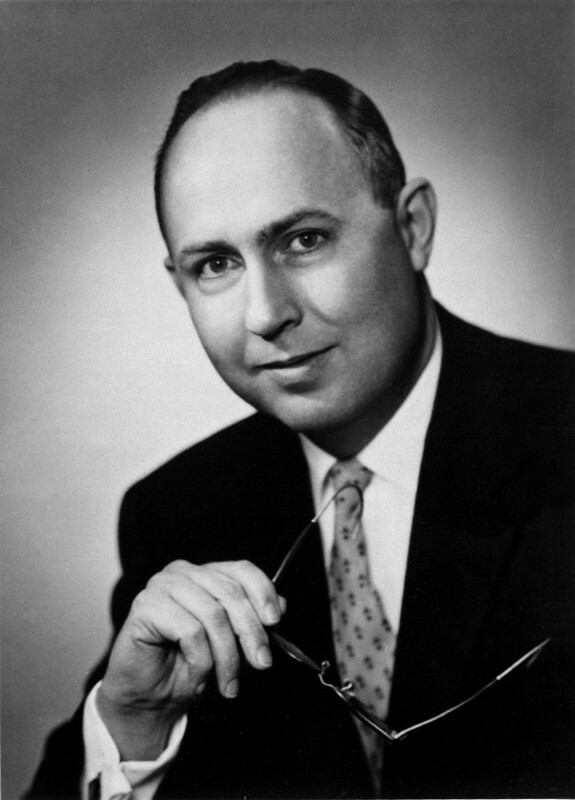 Dr. Harold W. See served as the founding executive of Southern Illinois University Edwardsville during the years 1955 through 1960. While serving as the director of the Belleville residence center from 1955 to 1957, Harold W. See became the catalyst for the formation by local citizens of an advocacy organization named the Southwestern Illinois Council for Higher Education. Dr. See directed the establishment of the Alton and East St. Louis residence centers (1957-1960). He served as the behind-the-scenes counselor for SWICHE, managed the fundraising effort to purchase property for the Edwardsville campus, and coordinated the local get-out-the-vote campaign to pass the November 1960 bond issue to fund construction of the new campus infrastructure. Dr. See played a unique and pivotal role in the creation of SIUE. 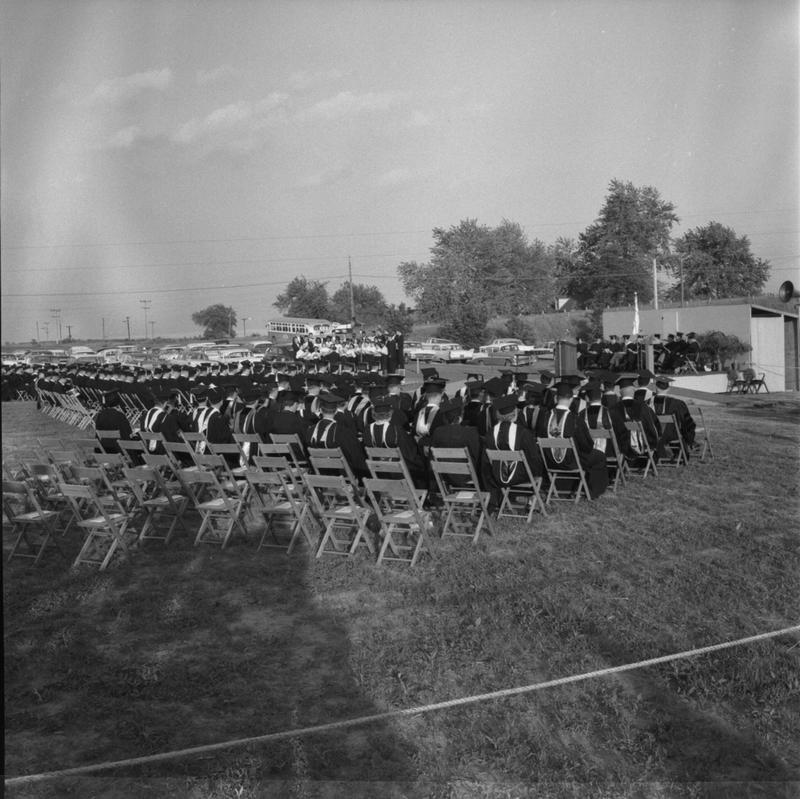 Illinois Governor William Stratton spoke at the first commencement ceremony held on one of the newly-purchased Edwardsville properties, June 14, 1960. 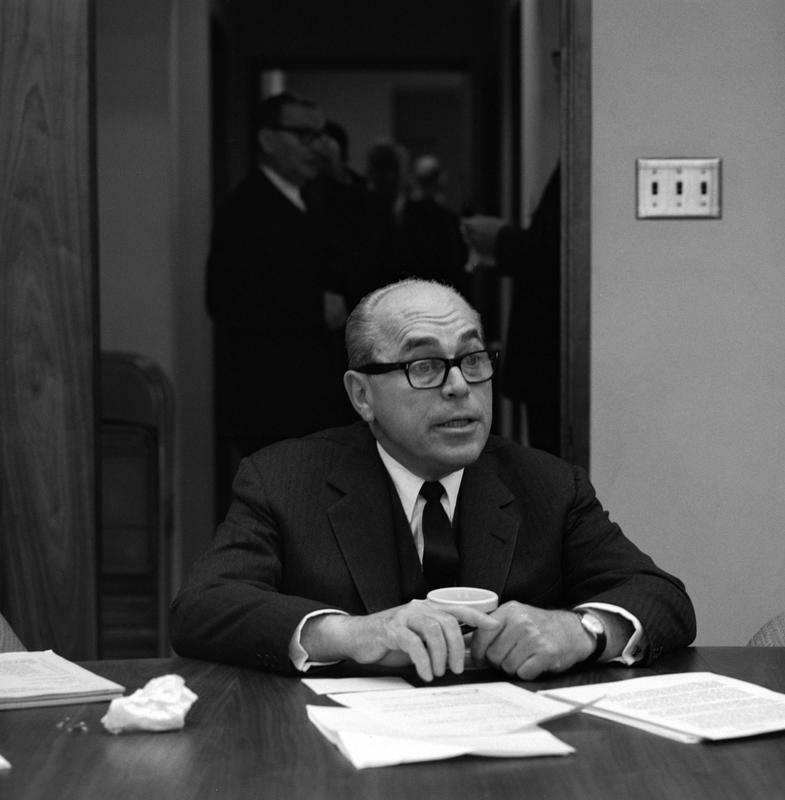 Stratton, urged on by local legislators and Southwestern Illinois Council for Higher Education activists, supported legislative appropriations to fund operation of the residence centers and advocated for passage of the November 1960 State Universities Bond Issue. 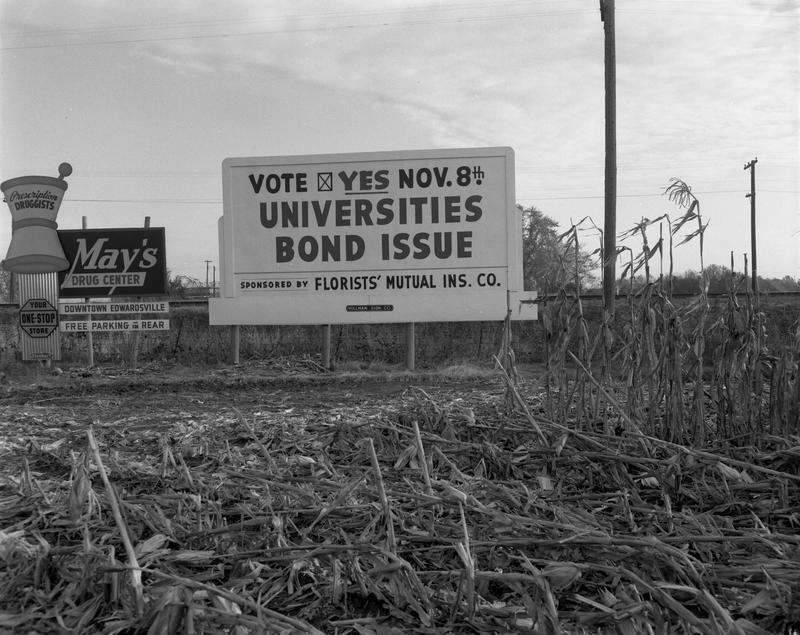 On October 3, 1960, more than 1,500 visitors attended a public rally in support of passage of the State Universities Bond Issue. The rally took place on one of the recently-purchased Edwardsville campus properties. During the festivities, guests were given the opportunity to experience a helicopter ride over the entire area of the envisioned campus. Angered that the repeated flights had disturbed his horses, one local property owner fired a shotgun at the helicopter. 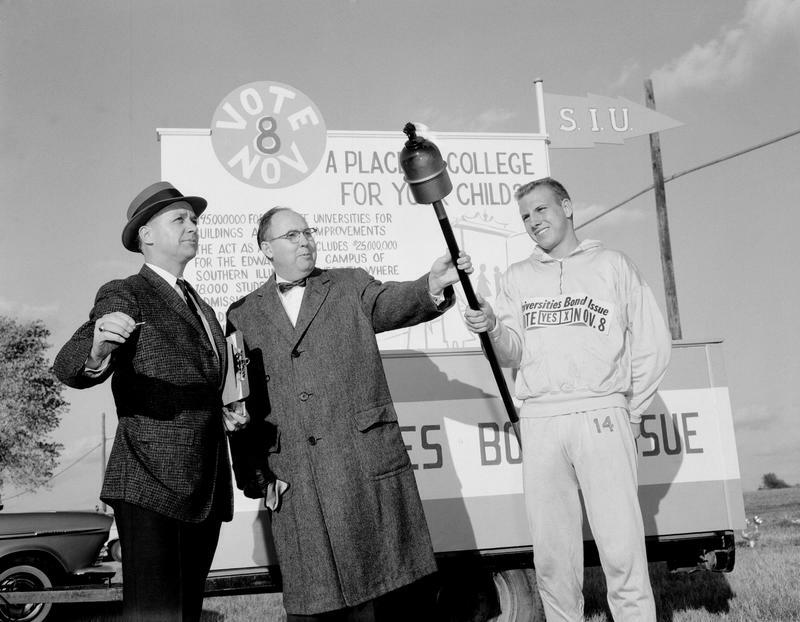 Forty-five student volunteers from the Alton and East St. Louis residence centers represented SIUE in an Olympic-style torch marathon run in support of the November 1960 State Universities Bond Issue. The local students embarked from Edwardsville at 4:00 P.M. on Wednesday, November 2, 1960. At Champaign on Thursday evening, the Edwardsville participants rendezvoused with fellow athletes from the other state universities in Illinois. The combined body of runners left Champaign on Friday morning and ran through the night, arriving in Chicago at 11:00 A.M. on Saturday, November 5. Voters from Madison, St. Clair, and Cook counties subsequently provided the winning margin of votes necessary for passage of the bond issue that earmarked $25 million to construct the original SIUE infrastructure and buildings. On January 16, 1961, a news release announced the purchase of the essential piece of property necessary for the Edwardsville campus. This property would become the location of the original core campus structures. A home on the 132-acre Freund farm stood near the site of the anticipated Communications Building (today's Dunham Hall). Existing trees surrounding the home found themselves preserved and incorporated into the green "islands" within the brick-paved central plaza. The university paid $155,000 for this property and structures upon it. 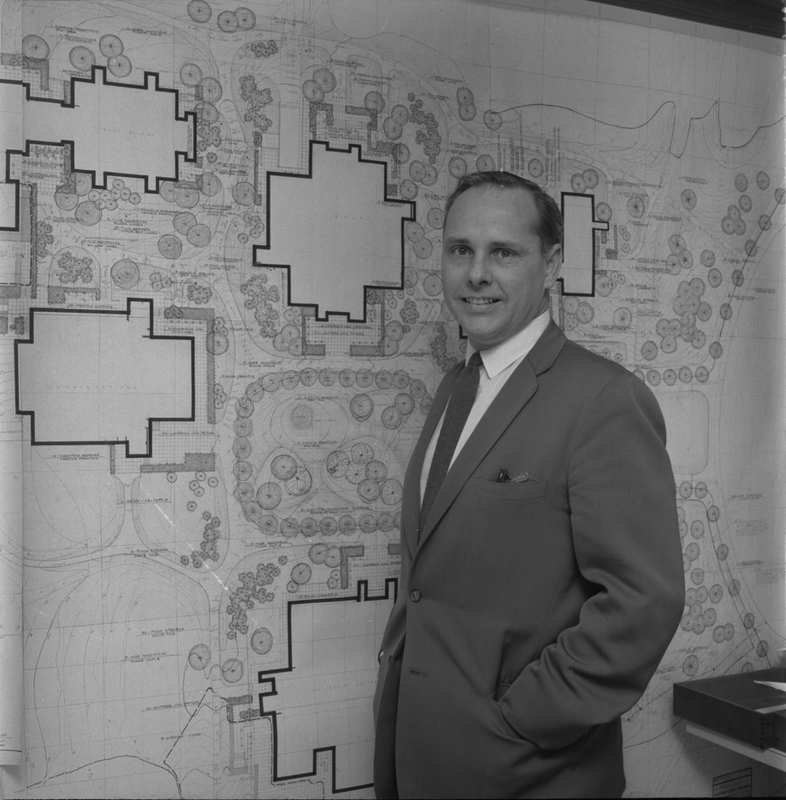 Arnold Harold Maremont of Chicago, industrialist and art collector, promoted and financed a path-breaking new campus planning exercise entitled "Environmental Planning / Edwardsville Campus" (EPEC) staged in East St. Louis on June 2-4, 1961. 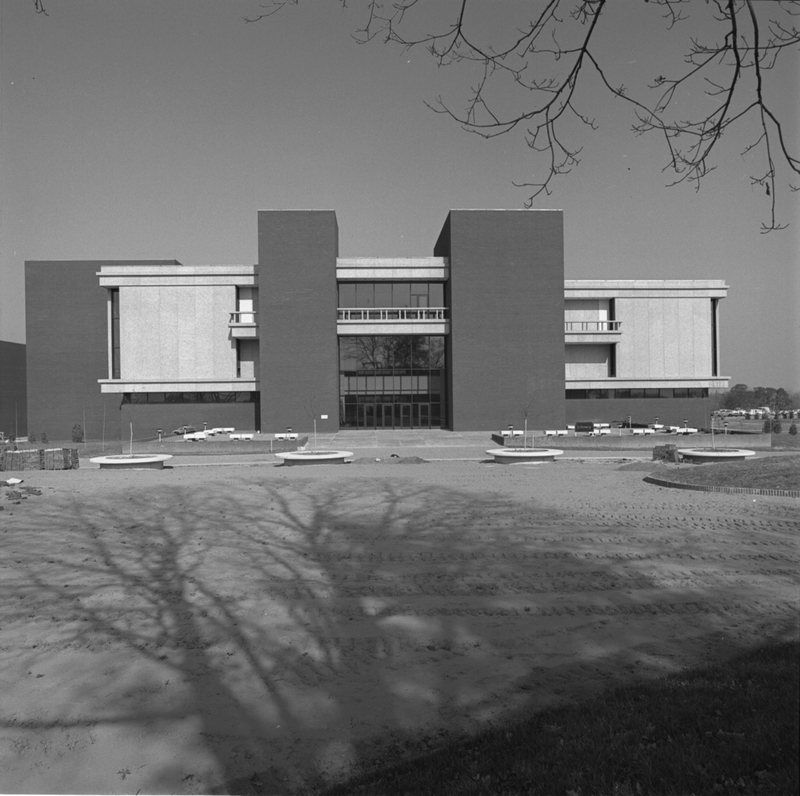 As a university trustee (1961-1967), Maremont firmly insisted that construction should not commence on the Edwardsville campus until Madison County, Illinois had first adopted a county zoning ordinance. 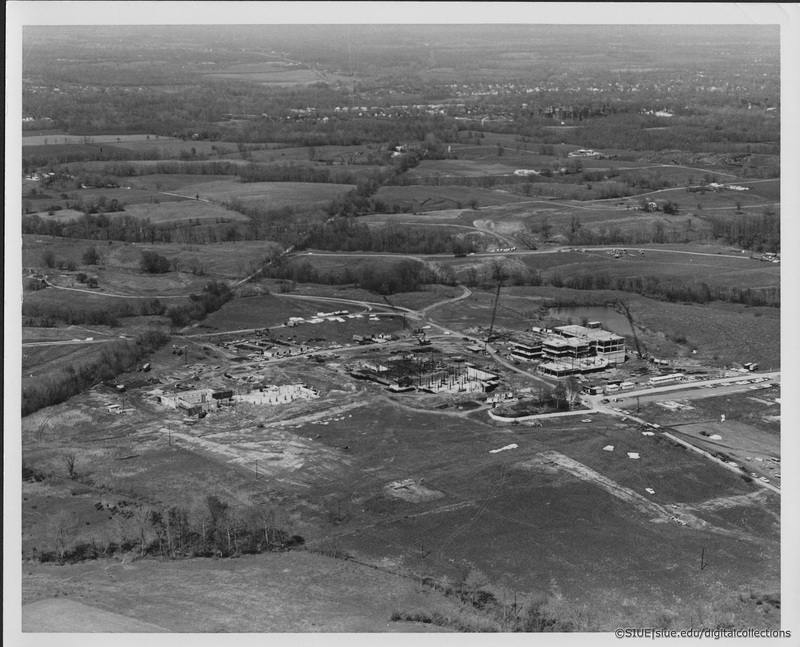 Maremont's determination to protect the natural and architectural beauty of the new campus environment from unwelcome adjacent influences postponed the start of construction for two years and ultimately forced the county government to comply on February 20, 1963. 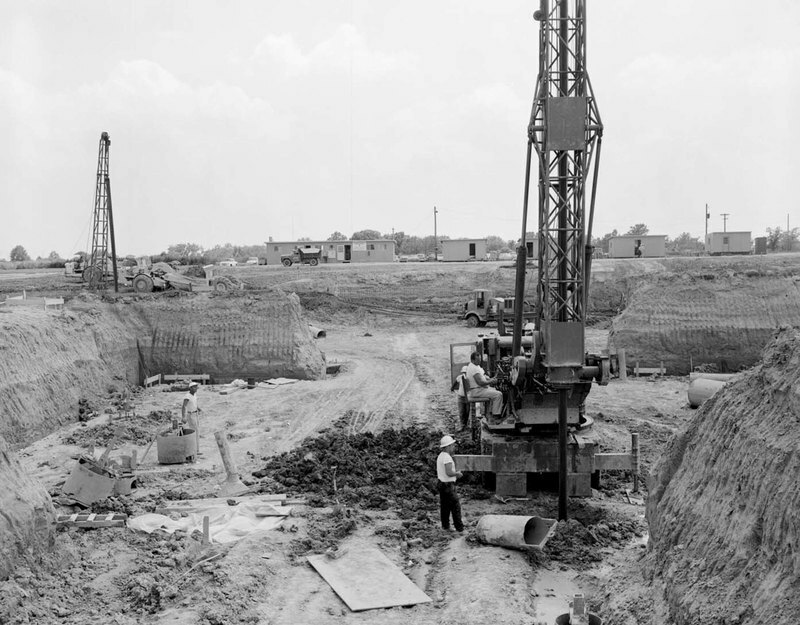 The official groundbreaking ceremony for the new Edwardsville campus took place on the Freund property on May 2, 1963. Construction began in the late spring and summer of 1963. The main campus construction road ran from this sign on Bypass Route 66 westwards to the core area. 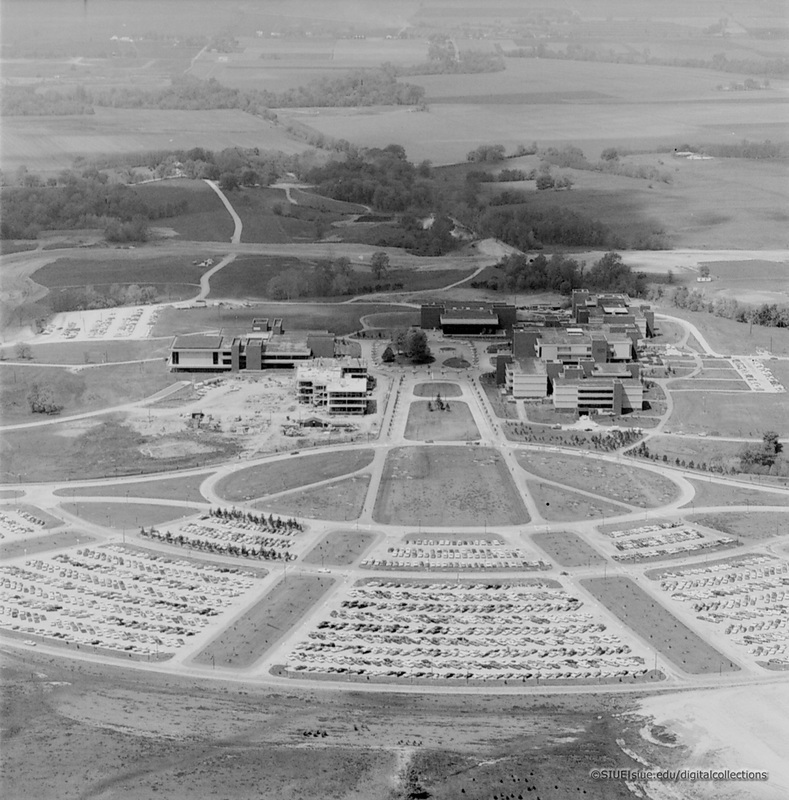 On June 15, 1960, the St. Louis architectural firm of Hellmuth, Obata and Kassabaum (HOK) was selected to prepare the Edwardsville campus master plan. To avoid being interned with his family and other Japanese-Americans during World War II, Gyo Obata transferred from the University of California to study architecture at Washington University in St. Louis. Together with George Hellmuth and George Kassabaum, Obata founded HOK in 1955. Obata's design of the SIUE campus, just one early triumph in a long series of remarkable achievements, made him one of the foremost architects of the twentieth century. John D. Randall functioned as the university's expert profesional liaison to Gyo Obata and the HOK design team. The son of prominent Chicago architect Frank Randall, and a great admirer of the work of Dankmar Adler and Louis Sullivan, John became an ardent historic preservationist. John Randall championed successful efforts to preserve the Wainwright Building in St. Louis and the Guaranty Building in Buffalo, New York. 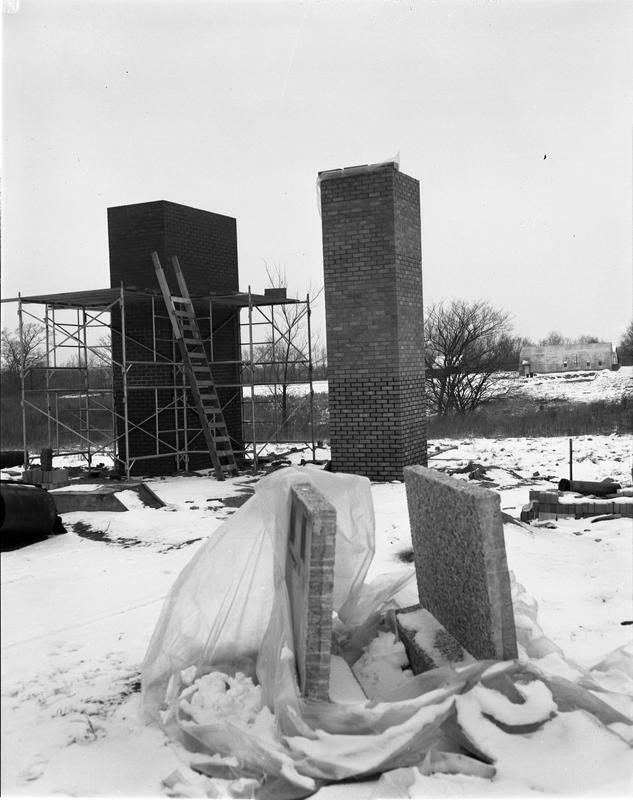 In order that the appearance and suitability of potential exterior building wall materials might be examined, the planners erected brick towers on the northwest corner of what is today the intersection of South University Drive and Cougar Village Road. 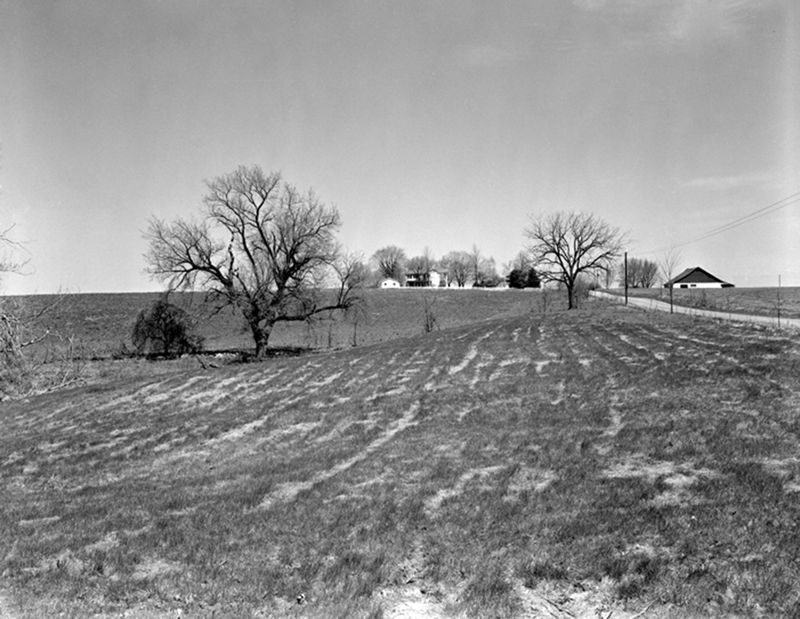 In this northward-looking photograph, the Quonset Hut Theater is visible in the distance to the right. The student Experimental Theater Organization rehearsed and presented its earliest on-campus theatrical productions in this existing structure acquired with the property. 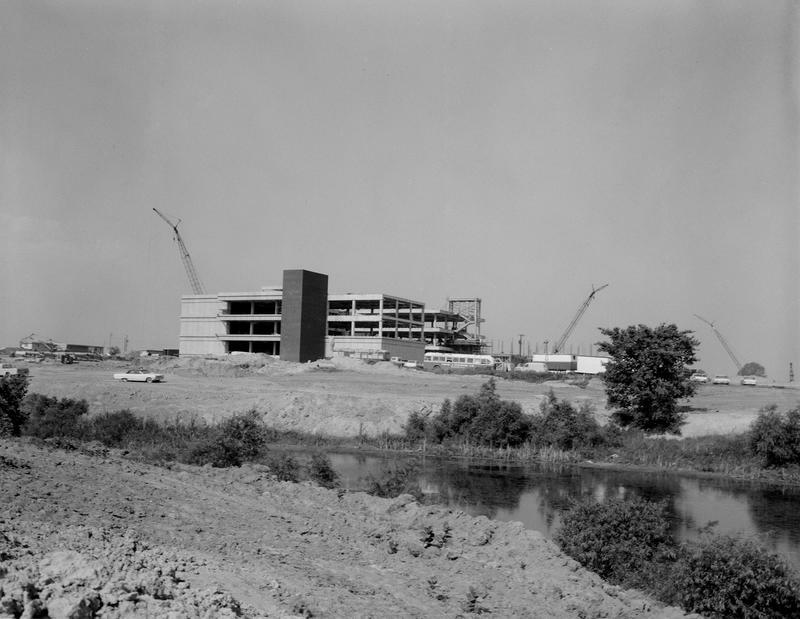 Construction of the Edwardsville campus began in the late spring and summer of 1963. The original buildings arose in a counter-clockwise pattern, beginning with the John Mason Peck Building. Next in order came Lovejoy Library, the Science Building (now Science East), the Communications Building (now Dunham Hall), the University Center, and finally the General Office Building (now Rendleman Hall). By coincidence, construction of the Peck Building and Lovejoy Library took place simultaneously (1963-1965) with construction of the Gateway Arch on the St. Louis waterfront. Busch Stadium construction took place between 1964 and 1966. In this view, looking from northeast to southwest, construction of the Peck Building is well underway. To the right, beyond a bus and a construction trailer, construction of the pillars for Lovejoy Library is visible. In the foreground is the small farm pond which predated the campus and remains today. The beloved original Cougar mascot, Chimega, who passed away on March 12, 1985, was buried near the pond. This aerial view looks down from the southwest to the northeast with Edwardsville in the distance. On the right, the Peck Building is well underway. To the left of Peck is the Lovejoy Library basement. Further to the left of Lovejoy Library is the Science Building basement. Excavation has not yet begun on the other buildings. The white fence protected the trees that had stood near the Freund home. A lower-level aerial shot looking from the southeast to the northwest. In a semi-circle from right to left: Peck Building, Lovejoy Library, Science Building, Communications Building, University Center. 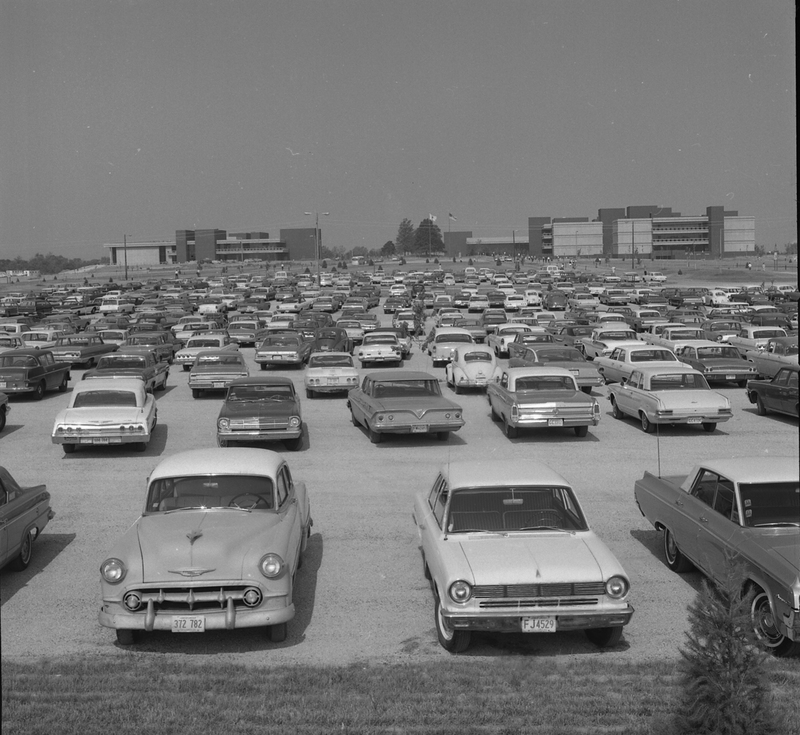 Following the "Environmental Planning / Edwardsville Campus" seminar of June 2-4, 1961, architect Gyo Obata adjusted his campus master plan to create the fan-shaped parking lots on the right side of this photograph. 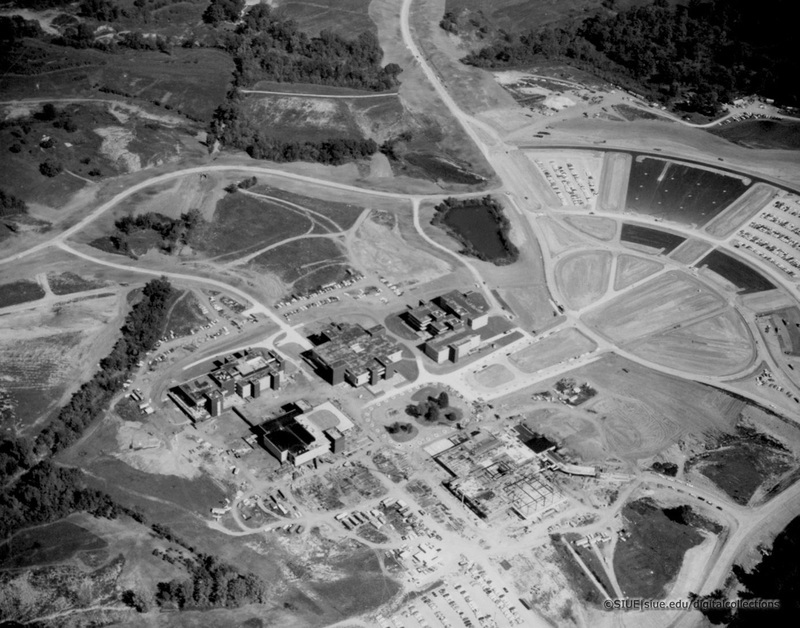 This aerial, looking to the north northeast, reveals the emergence of several recognizable campus features. For example, the Hairpin Drive is visible in front of Peck Hall. The center space is recognizable with mounds, trees, and planters. Circle Drive may be identified as well. 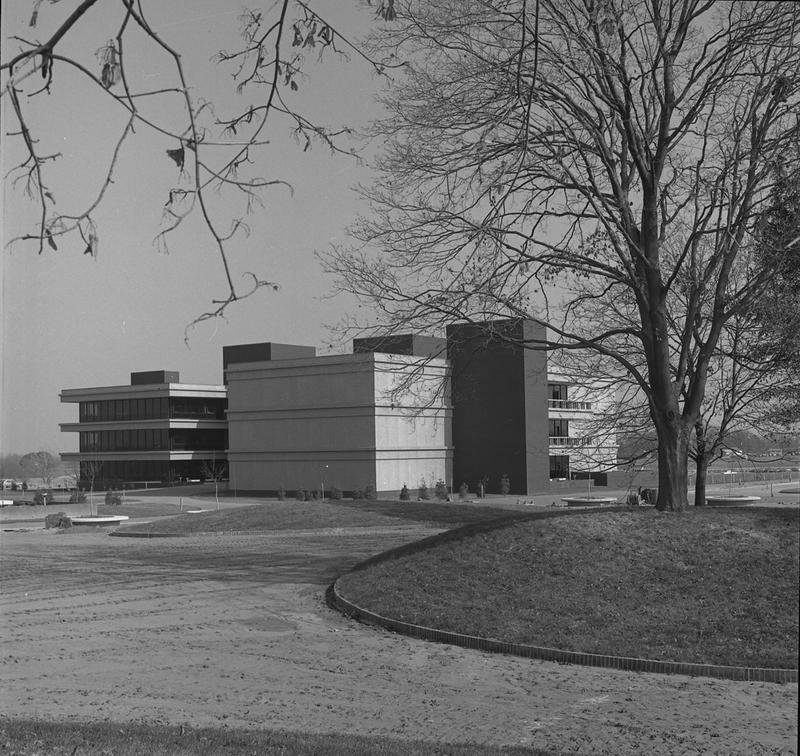 This ground-level image offers a view of the Peck Building in mid-1965 from the center of campus, looking to the northeast. Although the islands have been covered with sod and small trees planted, the ground has not been paved with bricks around the islands. 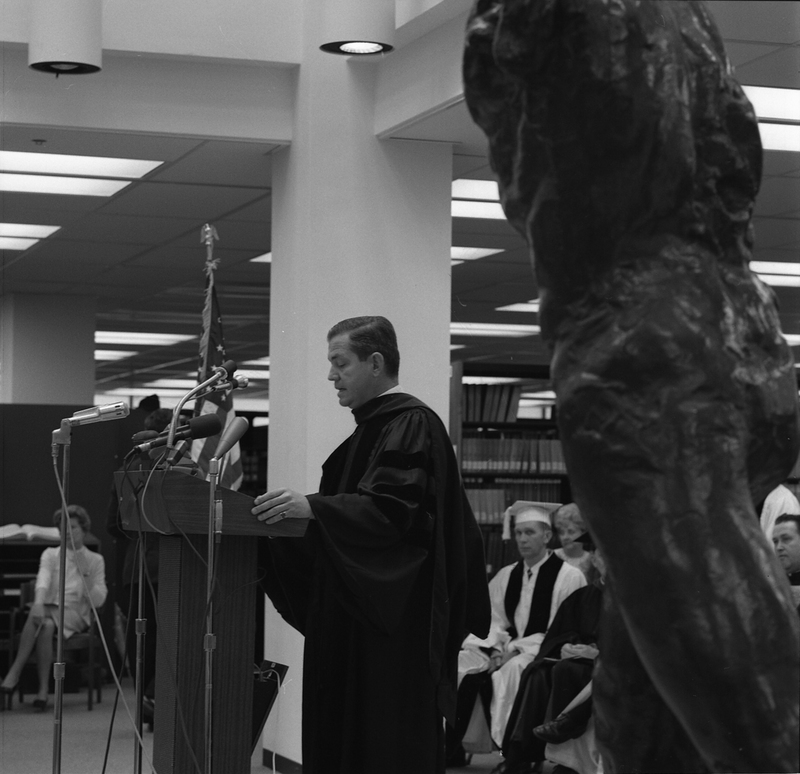 John Cushman Abbott served as the founding director of the library, joining the university in 1960. During the planning process, Abbott and his colleagues consulted extensively with Gyo Obata and John Randall during the preparation of a library building program. The most innovative of the original structures, Lovejoy featured an open central light well, four corner light wells on the second floor, and the extensive use of glass walls on the north side. 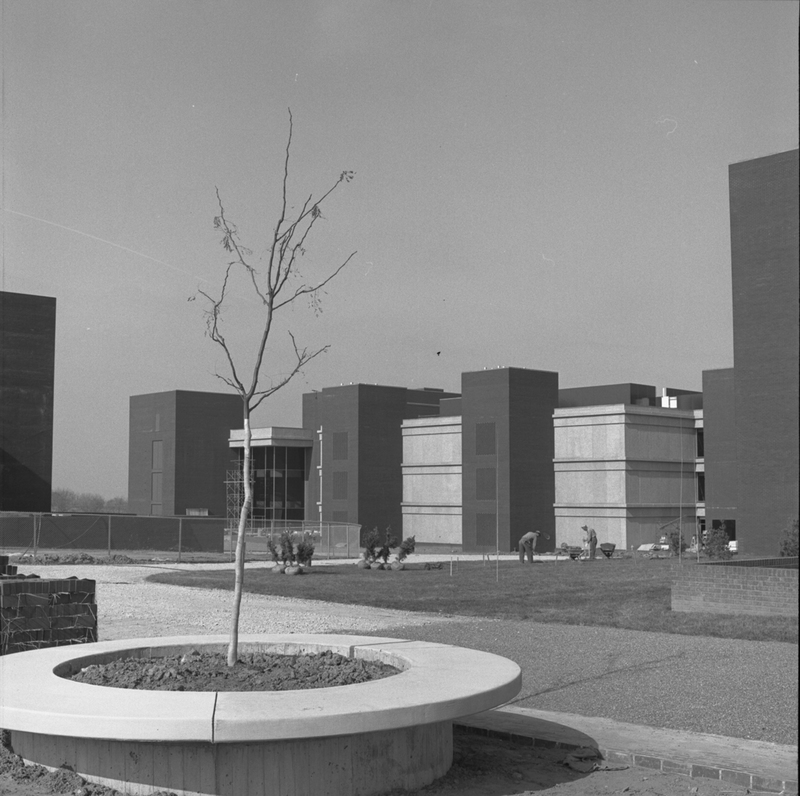 In this view looking to the northwest, workmen plant young trees near Lovejoy Library against the backdrop of the Science Building. The campus walkways are covered with gravel but not paved at this point. 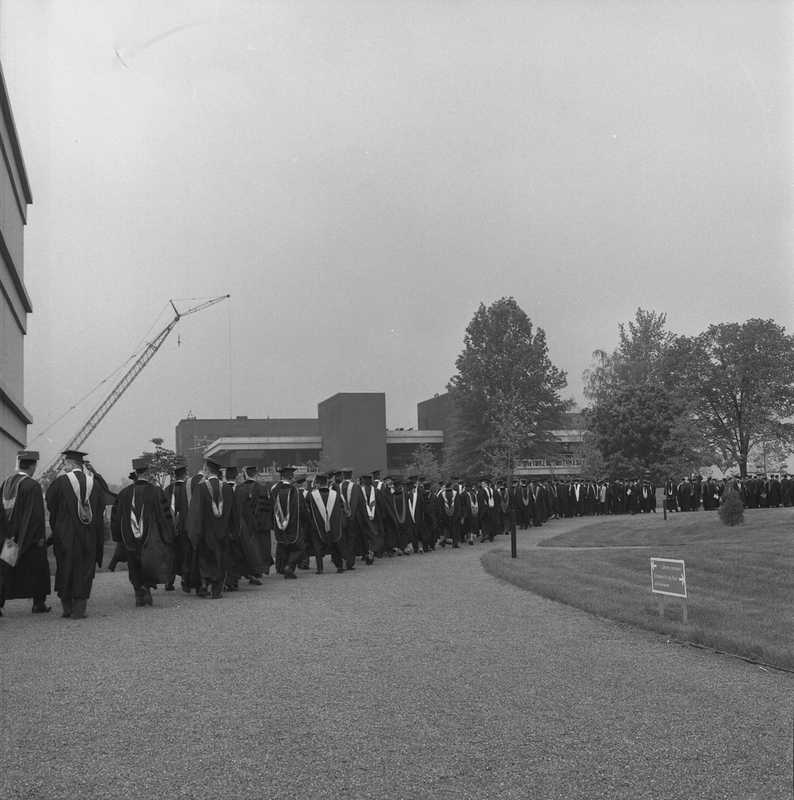 The Science Building would open for business on September 21, 1966 and an additional south wing of offices would be added during 1968-1969. This photograph of the east side of the Communications Building as viewed from the center of campus includes piles of bricks destined to be used for paving. The Communications Building did not become available for use until January 3, 1967. Robert Handy joined the university in 1962 with responsibility for planning the functions and staffing of the University Center. 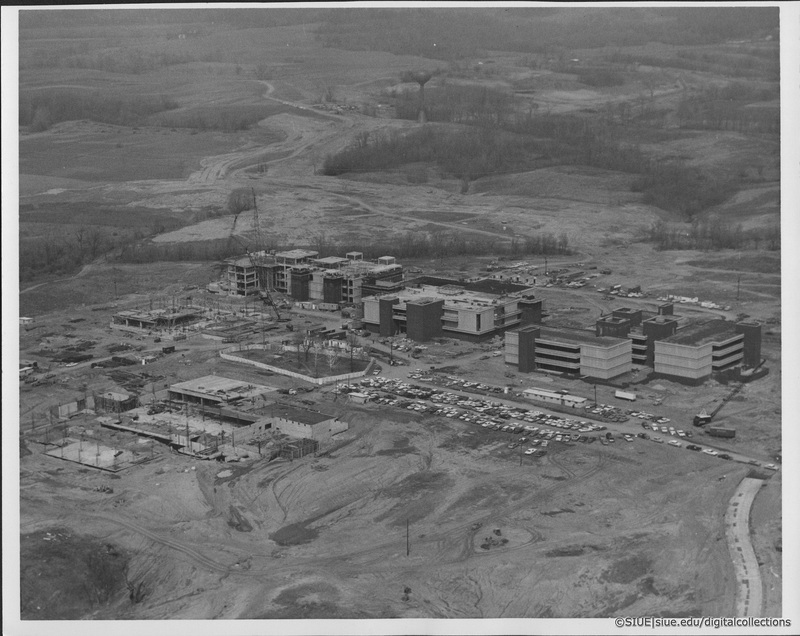 Handy worked closely with Gyo Obata and John Randall on the building design and successfully managed the facility and its operations until his retirement in 1974, in the process inspiring numerous SIUE students to pursue related careers. 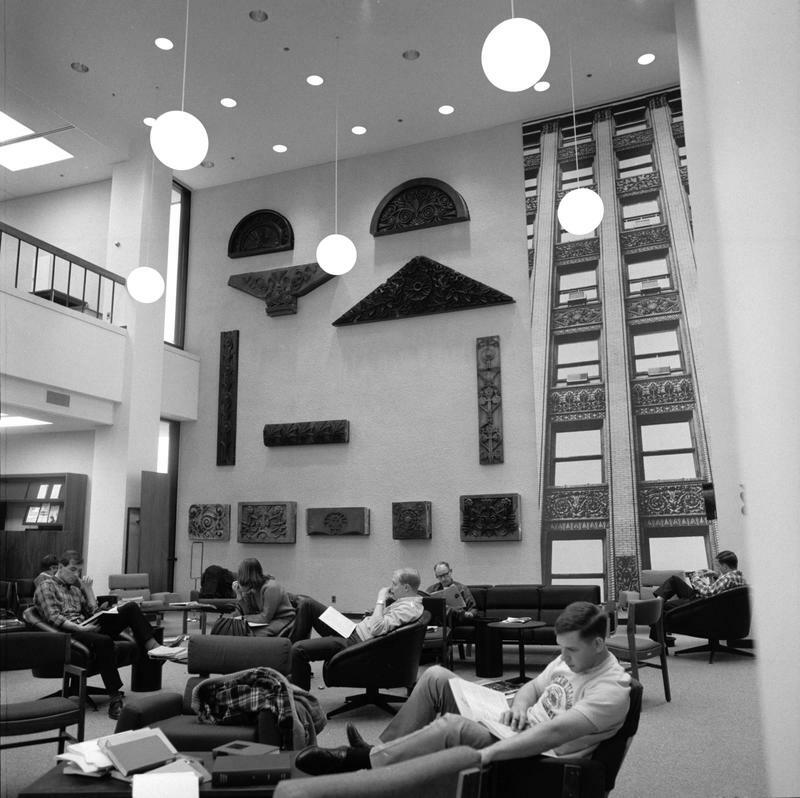 The University Center dedication took place on March 3, 1967. 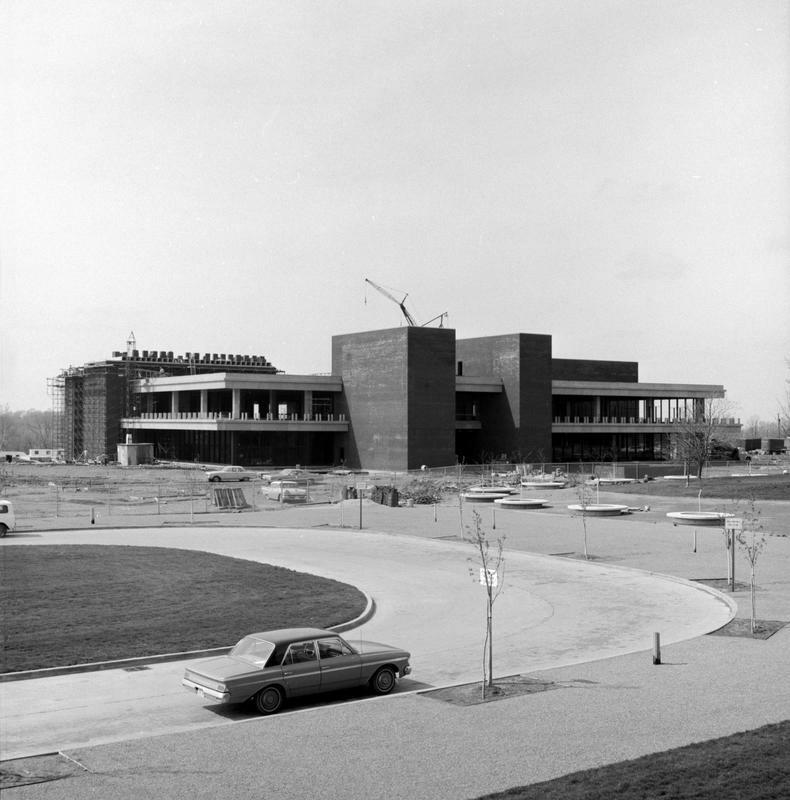 The completion and opening of the second floor of the UC followed on September 27, 1968. 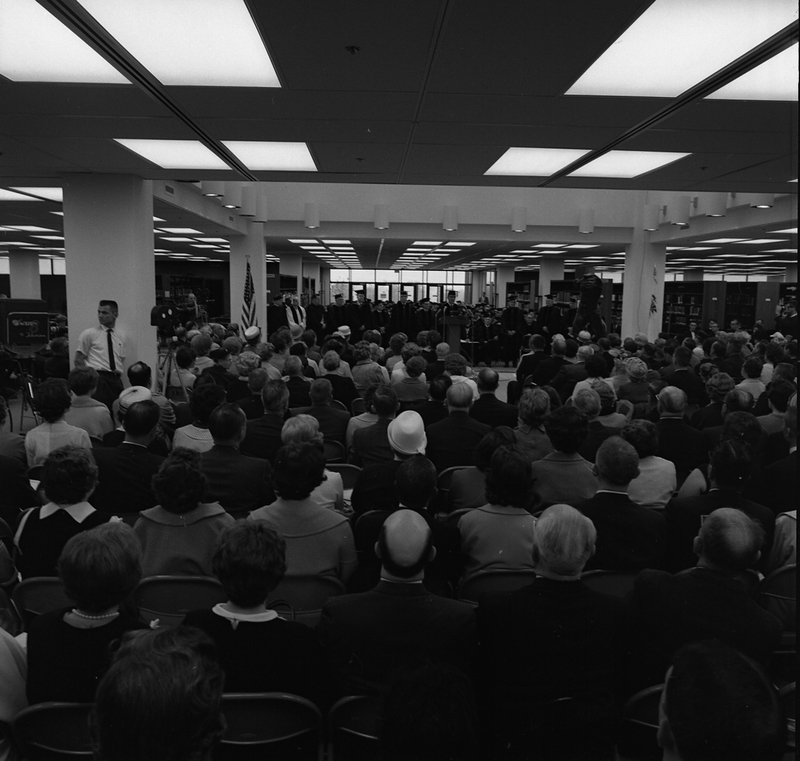 The official campus dedication ceremony took place in Lovejoy Library, in and around the central light well, at 10:00 A.M. on May 13, 1966. Professor Bruce Brubaker led the procession of faculty members dressed in academic regalia from their assembly point at the west entrance of the Peck Building to the South entrance of Lovejoy Library. 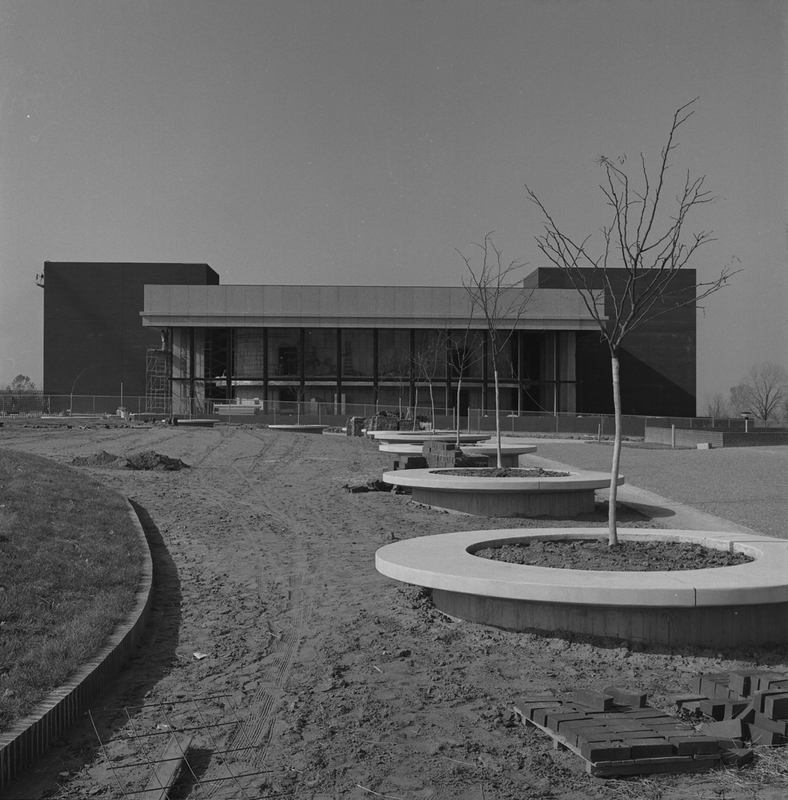 As of May 13, 1966, only the Peck Building and Lovejoy Library had been completed and opened for use. 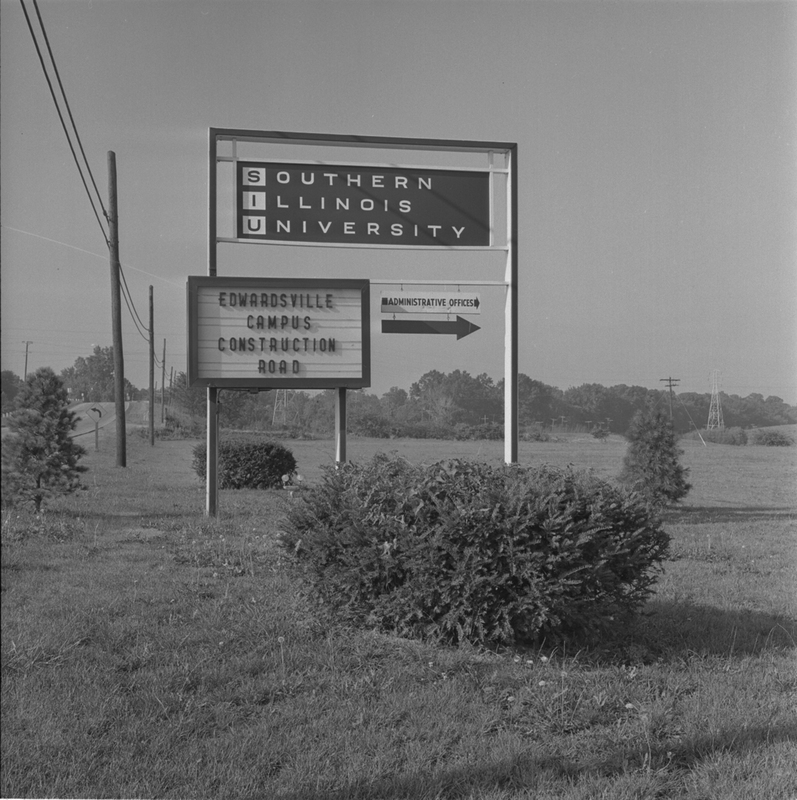 The opening of the Edwardsville campus on September 23, 1965, came ten years after the initial advocacy efforts by the Edwardsville Chamber of Commerce, and the official dedication ceremony of May 13, 1966 came ten years after the formation of the Southwestern Illinois Council for Higher Education (SWICHE). Many of the individuals most involved in these volunteer advocacy activities attended the dedication event, filling seats on all three floors around the library central light well, and experienced profound feelings of joy, hope, and satisfaction. Among those singled out for special recognition at the dedication ceremony was architect Gyo Obata. 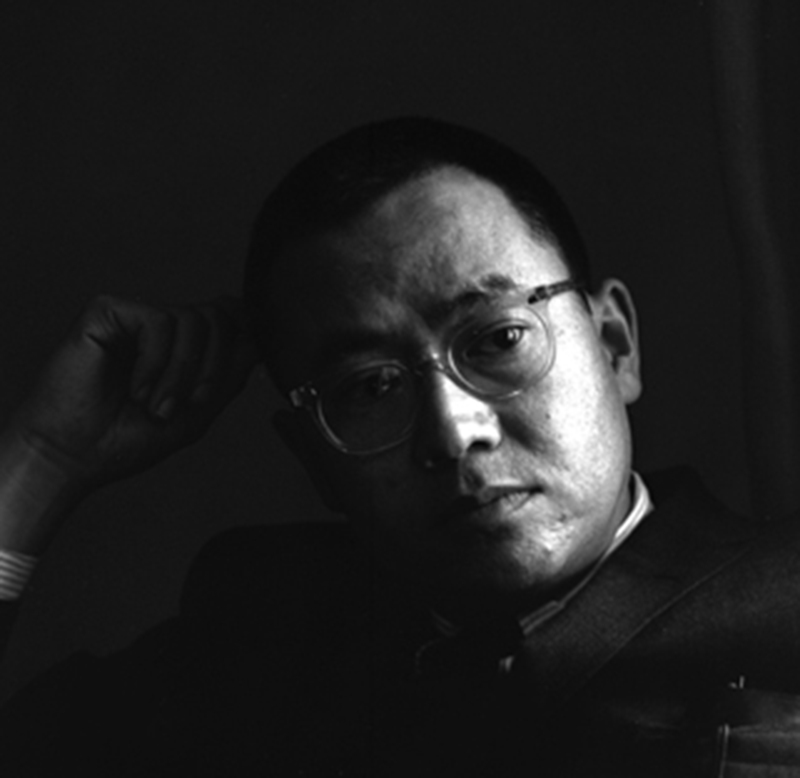 After graduating from Washington University in St. Louis, Obata had earned a master's degree under the direction of Finnish architect Eliel Saarinen. He began his professional career in the Chicago office of Skidmore, Owings and Merrill, next joined the firm of Minoru Yamasaki (who would later design the World Trade Center), and in 1955 allied with two colleagues to establish their own company in St. Louis, HOK. Thus, Obata designed the SIUE campus early in his most distinguished career. The dedication program featured remarks by dignitaries, including John Rendleman who delivered a congratulatory message from the governor, and music performed by the Symphonic Band under the direction of Dale Fjerstad and the Concert Chorale under the direction of Leonard Van Camp. In this photograph, John Rendleman speaks from a podium placed on the north edge of the light well with the assembled faculty seated immediately behind him. 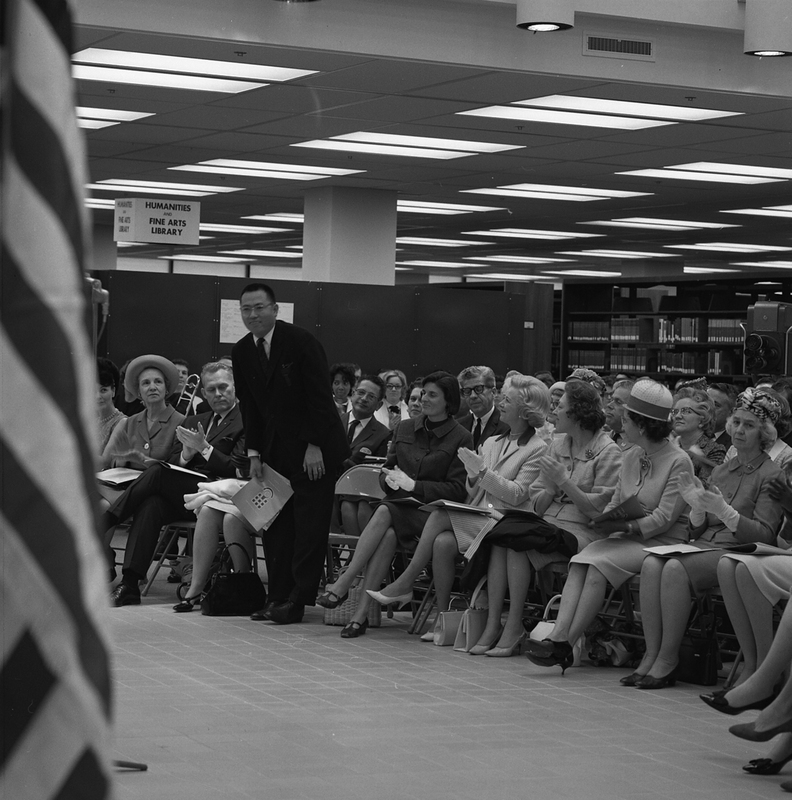 Lovejoy Library hosted both major ceremonies marking the campus dedication on May 13, 1966. A 7:30 P.M. library event opened for viewing by the public a unique display of historic building ornament designed by Louis Sullivan, rescued from demolition by pioneer Chicago preservationist Richard Nickel, and obtained for the university through the efforts of John Randall. An activist and visionary who would subsequently lose his life during a future salvage mission, Nickel attended the event and explained the history and provenance of the ornament to the audience. As originally placed, the Nickel Collection of Sullivan ornament continues to be displayed in the second floor, southeast corner light well of Lovejoy Library. The average cost of one gallon of regular gasoline in 1966, at the time of the campus dedication, was thirty-two cents. This photo looks west from the fan parking lots. Above the parked cars, the University Center is visible on the left, the Communications Building in the center, and the Peck Building on the right. It is unknown if Dr. Harold W. See, sometimes known as the forgotten father of SIUE, was familiar with Daniel Burnham's exhortation: "Make no little plans; they have no magic to stir men's blood and probably themselves will not be realized. Make big plans; aim high in hope and work..." But Harold See and the thousands of citizens of Southwestern Illinois who shared his vision certainly made big plans, aimed high in hope and work, lobbied, donated, voted, and ultimately succeeded in transforming their dream of greater educational opportunity for their children into reality.